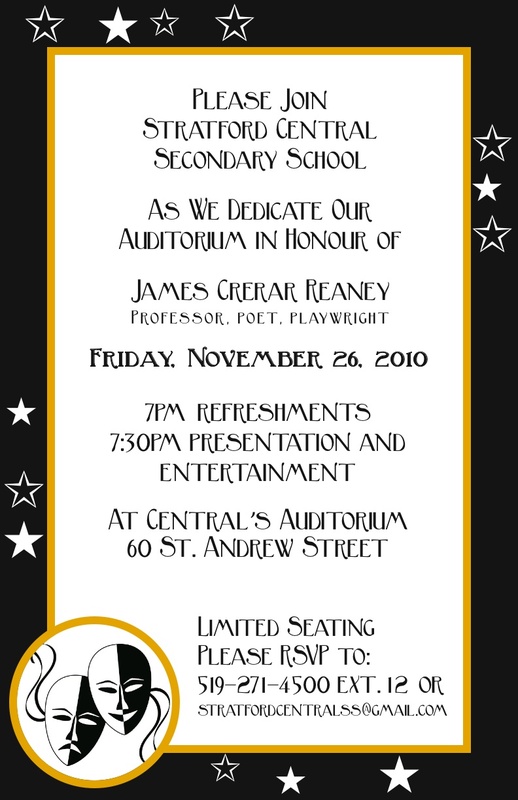 On November 26 in Stratford, Ontario, please join us for a gala celebration at Stratford Central Secondary School to dedicate the James C. Reaney Auditorium. The evening will begin with a brief reception at 7:00 p.m. and the program will begin at 7:30 p.m.
James Reaney attended Stratford Central from 1939-1944. To honour his achievements as a poet and playwright, the school made him its first inductee into its Arts Hall of Fame on May 6, 2010. As part of the evening’s celebrations, students will perform a scene from Mimi Lights the Candle, a school Christmas play James Reaney wrote in 1943 when he was a student. Thank you Lois Tarr, a former classmate of James Reaney’s, for preserving your copy of the script all these years! Admission is free, but seating is limited. Please reserve a seat by sending an email to stratfordcentralss@gmail.com or calling 519.271.4500 and asking for Diane Yausie, Head Secretary. Stratford Central Secondary’s address is 60 St. Andrew Street, and the auditorium is located on the second floor near the front entrance to the school. 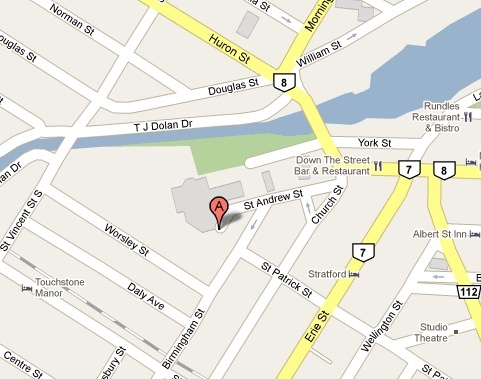 There is limited parking behind the school, and there are quite steep stairs at both the front and back of the school. Hope to see you there!